Relive the warmer days and calmer nights of Westeros when Game of Thrones: Season 1 makes its highly-anticipated debut on 4K Ultra HD optimized for Dolby Vision High Dynamic Range on June 5th from HBO Home Entertainment. Heralded as an “HBO triumph” (Boston Globe), Season 1 of the visually stunning fantasy epic, described as a “menacing, brutal and complex solid start” (The Guardian), includes all 10 episodes beautifully redone in 4K format to give fans the ultimate clarity and detail on HDR TVs. 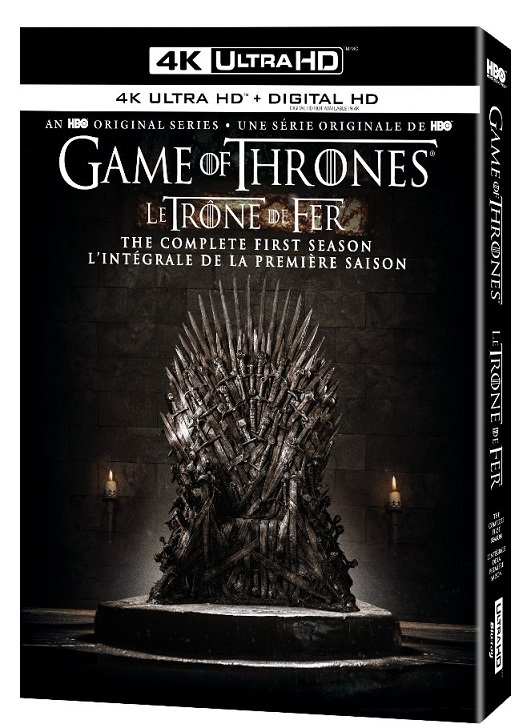 A perfect gift for Father’s Day or way to kick off summer break, the 4K Ultra HD format for Game of Thrones: Season 1 comes with eye-catching key art featuring the iconic, all-powerful Iron Throne. With this release, fans and those new to the series alike can now catch more than 600 minutes of one of the most critically acclaimed first seasons of episodic television in striking clarity. In addition to Season 1 episodes, fans can go beyond what started it all, with hours of gripping bonus features, from behind-the-scenes, making-of sequences, audio commentaries and much more. Game of Thrones continues to be the most successful franchise in HBO history and remains the most awarded drama series in Emmy® history, with 38 Emmys® to date. Animated Histories: Learn about the mythology of Westeros as told from the varying perspectives of the characters themselves. Anatomy of an Episode - an in-episode experience that explores the creative minds and colossal efforts behind episode six, "A Golden Crown." Making Game of Thrones -an exclusive 30-minute feature including never-before-seen footage from the set and interviews from the cast and crew. Character Profiles - profiles of 15 major characters as described by the actors portraying them. Creating the Show Open - an inside look at the creation of the Emmy-winning opening title sequence for Game of Thrones. From the Book to the Screen - executive producers David Benioff and D.B. Weiss along with author George R.R. Martin talk about the challenges of bringing Martin's epic fantasy novel to life on HBO. The Night's Watch - an in-depth look at the unique order of men who patrol and protect the Wall, a 700 foot ice structure that separates the Seven Kingdoms from the darkness beyond. Creating the Dothraki Language - an insightful glance into the comprehensive language created for the Dothraki people in Game of Thrones. 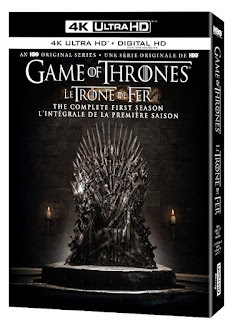 Audio Commentaries - Seven audio commentaries with cast and crew including David Benioff, D.B. Weiss, George R.R. Martin, Emilia Clarke, Peter Dinklage, Kit Harington, Lena Headey, Mark Addy, Nikolaj Coster-Waldau, Maisie Williams, Sophie Turner, Isaac Hempstead Wright, Bryan Cogman, Harry Lloyd, Daniel Minahan and Alan Taylor. A Digital Download code for the ten-episode season in HD.